SIX NATIONS WINNERS. Grand Slam champions. Victory against the All Blacks. World number two. There’s no question that 2018 was one of the biggest years in the history of Irish rugby. Now Joe Schmidt’s side must try to carry that momentum into the new year and all the way through to the Rugby World Cup in Japan this autumn. So, all eyes are on the Aviva Stadium and Saturday 2 February as Ireland open their Six Nations defence with a mouthwatering clash against their nearest, dearest rivals, England. To set the scene for what promises to be an enthralling championship, we’re returning to the Liberty Hall Theatre on Dublin’s Eden Quay for a very special preview event on Thursday, 31 January @ 7pm. 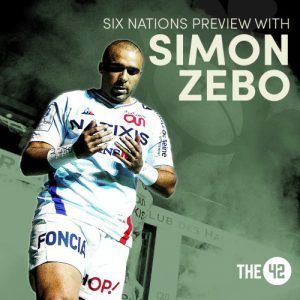 We’re delighted to be joined former Munster and Ireland star Simon Zebo for an in-depth live conversation with The42‘s very own Murray Kinsella and Gavan Casey. The Racing 92 man will give us the lowdown on his new life in France and the Top14, share his insights on what makes Schmidt’s Ireland tick, and take a closer look at how the other nations are shaping up in their bid to topple the champions. Tickets are €20 and you’ll receive a complimentary copy of The42‘s latest book, Behind The Lines II, on entry.